I made another visit to the new ocean entry. The entry has moved further east and as of this writing is spreading. For now there isn’t much of a bench being built. It’s not really vigorous enough to build the bench as fast as the ocean breaks it down. Of course this can all change quickly. One part is building more of a vertical bench. It was very windy as usual. Shot way too much video. Some of my images show a progression of two nice breakouts on the western entry. It didn’t last very long but, there were some nice chunks of lava falling down to the ocean. I brought my big Sigma 120-300 mm 2.8 lens. Haven’t used it in nearly two years. Being that it’s a short hike and not as much water is needed, I decided to bring it along. It weighs 8 lbs. I wasn’t sure if the strong winds were going to lead to slightly blurry images while using such a big lens. All turned out great. I’m still using my F-Stop Tilopa camera backpack. Also my Lowepro hipster bag on the waist belt for easy access to gear while on the move and for using while set up at a site. They both work well together. Click on the image below to visit the gallery. Video can be seen here. In case you missed it, I added video from the previous hike to my volcano video page. Lava flowing over a 40′ sea cliff into the ocean. Well, the lava flow did finally reach the ocean. It’s maybe half a mile west of the old Waikupanaha ocean entry. It’s an easy walk of less than one hour. Nothing ultra spectacular and in a difficult place for great close up viewing. Still great to see. The coastline is very sloped and can be dangerous. Viewing from further back to the east could be best. You can see this in my new photos. I spent most of my time on the western downwind side. Lots of lens cleaning but, I figured when others started arriving at sunrise none would venture over to that area. It worked out well. The flow was still shallow and plenty hot crossing but, nothing I haven’t done many times before. I also wanted the sunrise sky but, sunrise wasn’t very spectacular. It was nice though. I didn’t shoot too many images even though I was out there from about 12 am Sunday through sunrise. Shot some nice video that I am starting to edit. The flow is still sluggish like they have been over the past year now. Not sure if this has enough volume to keep going. Get to it while you can. If your unsure of hiking to it yourself, I do on occasion take small tours but, we are out for long periods of time. Information can be found on my “Services” page. If a shorter excursion better suits you, I have references of private parties who live down there. This is an easy hike but, it’s still not for everyone. For all of you Nikon D800 owners or Nikon/camera people in general, there’s a good chance this is the first time a lava flow ocean entry has been captured with a D800. What I can tell you is it performs beautifully just as I had expected. I shot several night shots at up to 3200 ISO and they are very clean with only minimal noise reduction applied in Nikon’s Capture NX2. I shot between iso 100 and 3200 with most being in the 500-1000 range. Where the D800 really shines is exposure. I won’t get into exactly what I have the camera settings at. This isn’t a tutorial. I’m just letting you all know the camera is very capable in low light and very harsh contrast conditions. Many were concerned with the 36mp sensor and noise. What I find is it also depends on the lens used an under what lighting conditions. Much of the night video was shot at very high iso’s up to 5000 and again it did great. No issues with battery life. I do carry 2 and only needed to switch over after sunrise. When the short video sequences are finished and loaded I will update this post. Unfortunately all through sunrise a helicopter hovered low and right near the flow. So, that’s all one can hear. It wasn’t the usual tours as they arrive at 7:45 am daily. It also wasn’t a production company that I could see in my close up images. Just four people with point and shoot cameras from what I could see. Figured I might as well get photos and video of them as they were doing the same of me and the lava. Maybe Paul Allen’s people? His mega yacht has been in Kona for several days now. It does house two helicopters. Yes, its huge! I was hoping for at least one dinner invite while it’s in town. One of my lava flow metal prints would look good in it. Or it was just a local privately owned tour. 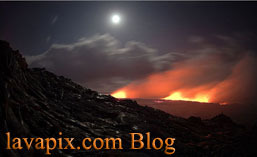 I have added a new lava flow video page on my website. For now a couple of crude time-lapse ones and a short video. All from recent lava hikes. Nothing fancy. I’m not trying to be some famous Hollywood producer. This leads me to my “Don’t try to do what I do” rant. Don’t try to be a famous film producer doing what I do unless you have lots of expendable funds and nothing better to do. Oh wait, I just said I’m not trying to be one…This is the type of warning you get from me when the lava flow is easy to get too. Do watch the HVNP lava safety video I posted on my website. Pay close attention to what they say about new land. Also know as benches or deltas. Links to points of interest from this post. 11-25-12 Lava Ocean Entry Nikon D800 I noted the iso used on a few images in the caption information for you D800 users. Volcano video page Update – Video from this hike has been loaded to the page.